Claim your Oculus Key at http://pages.nolovr.com/ and redeem it at Oculus Redeem page. Note：The NOLO HOME windows client need to be used together with NOLO HOME app. Immerse yourself in 6DoF SteamVR gameplay experience with NOLO CV1 by using NOLO HOME streaming software. We also released a firmware update for NOLO CV1 controllers and headset maker (for Oculus Go & Gear VR)!!! The firmware updater is located in the NOLO HOME windows client. If you have an Oculus Go or a Gear VR, why don't you try out this FREE and stable streaming software this weekend and share with your friends! Genius move using ALVR.. the streaming is near perfect over 5ghz for me even at 100mbps bitrate. My only grumble is that the tracking of the controller is playing up for me at the moment, jerky motions on the left controller like randomly thrusting forward? I doesnt make it unplayable just a bit annoying. Any recommendations? @WJRev Hi, thanks for your message. Could you record a short video about the issue you mentioned? What about ceiling mode support? Wow, this is great! Works much better than Riftcat even on my Oculus Go and my 2016 MacBook Pro with a measly Radeon Pro 460 in Boot Camp. Ceiling mode works great. Very sharp images and reasonably responsive. The image waivers around and lags a bit, but it's still usable for most apps I've tried. I was surprised that lowering the streaming quality didn't help so it might just be a limitation in the precision of the tracking. One thing that made it hard to install turned out to be my old side load installation of the GearVR Nolo Home. The installer didn't like another app named Nolo Home and I don't know why it was named the same, especially since it serves a very different purpose. Very strange. I've now lost the ability to use the Nolo controllers with standalone apps on my Oculus Go. Not a huge deal but I was looking forward to more 6DOF apps coming out. Thanks for a terrific update! @Vinoh How you can switch to Ceiling mode? Is there a way to disable the Graphics Card check? I have an RX 480 that should be able to handle this just fine, but I can't get though the user guide. @djelinek Hi, thanks for your message. The NOLO HOME streaming software currently does not support Ceiling mode. @vrokolos Yes. it's based on ALVR. Please go to setting, and select Custom under Streaming quality, then you can adjust the Video Bitrate, Video Resolution, and Buffer Size. @WJRev Thanks for your message. The website you provided cannot be accessed. Could you send it to our support team at support@nolovr.com includes your forum ID? @Vinoh Thanks for your feedback. I will pass your message to our dev team. @moocow1452 Hi, just close the user guide. You could also start the streaming service in the main interface. Find your device in the device list on the top right, and press the connect button once your device shows from the list. Make sure the NOLO HOME app has already been launched from your Oculus Go or Gear VR. @admin, I might be missing something very obvious, but I don't have an option to start the streaming service on my UI, which is strange, because I can stream just fine over ALVR. I can start SteamVR to change the streaming service display to On, and I'm using a Go that can connect and stream normally with ALVR, but the Nolo client seems to be missing an option to start the stream and select a device. @djelinek I didn't do anything special to start ceiling mode and I can't find a setting for it. However, when tracking was backwards in regular mode, I put the base station back on the ceiling and it worked great. I had been using RiftCat and the older Nolo driver app in ceiling mode before and maybe that configuration carried over somehow. Admittedly very strange but I'm not complaining. @djelinek, @admin I have more to report on how I inadvertently got ceiling mode working. The headset marker was connected directly to my computer with the Nolo provided cable rather than using the short cable to the Go. I then ran and quit the older Nolo Assistant which had ceiling mode selected. Somehow, with its settings and perhaps some driver functions, this enabled ceiling mode to work on Nolo Home. When I use the short cable, I can only use non-ceiling mode. BTW, while the performance of the controller tracking is quite good, headset tracking seems laggy. Sometimes, like it Tilt Brush, it works OK as I move through a drawing. However, when I bend over in an environment like Steam Home, the floor seems to come up to me as much as me going down to it. I suspect that illusion is caused by the lag but I'm really not sure. As I said before, my GPU is marginal so that may be why. I did play around with the custom settings and nothing, even going way down in resolution, helped so maybe there is something else going on. Turning my head works perfectly, I suppose since this 3DOF processing is done by the headet. @moocow1452 Thanks for your reply. Please launch the NOLO HOME app from your Oculus Go first. (Cover the sensor in the middle of two lenses with your finger to keep the headset activated) Then NOLO HOME windows client will detect your device. It will shows at the top right column, under the device type. @admin Will be Ceiling mode added later? @djelinek Hi, thanks for your message. We are collecting users' needs at this stage. So I must say perfect work. I have played about 8 hours and all is stable no any crash of Nolo Home on Oculus Go or PC. Please add ceiling mode and it will be ideal. @djelinek Thanks for your feedback! I second the need for ceiling mode, I only started using it just before NOLO HOME release but it vastly increases immersion! The other question I have is now since the firmware update the headset marker HAS to be connected to the phone am I correct, because in this case I cannot charge the phone at the same time? @WJRev @djelinek, In my experience, ceiling mode works if I connect the headset marker to the PC and launch the older Nolo app, select ceiling mode and quit the app before launching Nolo Home. @WJRev Just a quick check if you are using cardboard? For this version of NOLO HOME windows client, it is only compatible with Oculus Go and GearVR. The headset marker should be connected to the Oculus Go or Gear VR via USB OTG cable. 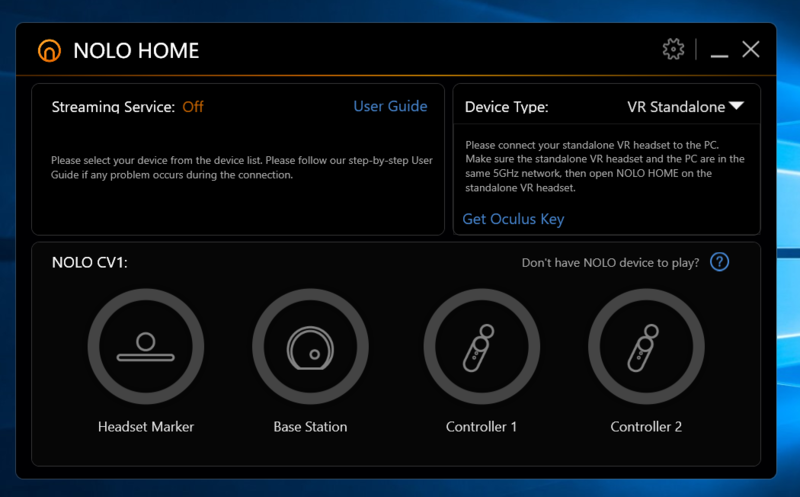 @admin I tried syncing the Nolo Home Oculus Client with the PC Server, no change in the upper right Device Type section. While I was testing, I was able to connect and stream to the Nolo Client from the ALVR server, so I think that the holdup might be something in the Nolo server software. @admin I am using GearVR and working great. Just wondered if there was anyway to connect marker to PC do phone could be charged. But guess not. @moocow1452 Hi, can you check if the firewall has been turned off? If not, turn off firewall and try again. @WJRev Thanks for your reply. Sorry, the headset marker has to be connected to the Gear VR. Pleas add Auto Connect to last device like in ALVR.